Banish your symptoms and take back your health in just 30 days with a clinically proven program that has empowered thousands, from world-renowned Functional Medicine physician, Dr. Amy Myers. Join the SIBO Breakthrough™ Program! 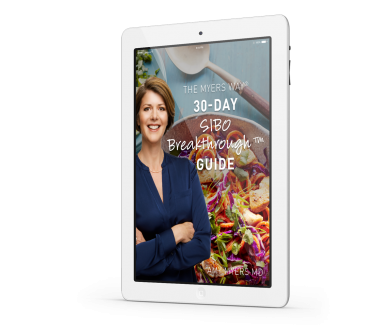 Enroll in The SIBO Breakthrough™ Program to reclaim your health in 30 days! Your results are on the way to your email inbox! The wide array of symptoms can range from debilitating digestive drama such as constipation and diarrhea, extreme and constant bloating, embarrassing gas, mounting food sensitivities, and even skin issues and other seemingly mysterious skin conditions. To make things worse, SIBO is all too often misdiagnosed, which gives it the chance to compound symptom after symptom as destructive colonies outnumber your body’s natural defenses. You’ve suffered long enough and wasted enough money on ineffective remedies! Now is the time to use the system that has supported thousands of patients in Dr. Myers’ clinic who have effectively faced their condition. This exclusive online offering includes the supplements you’ll need to support you gut microbiome and immune system when going to to toe with this insidious bacteria that is out of place and out of control. Before we dig into how this works and what’s included, let’s take a look at how SIBO can cause so much damage. SIBO’s role in the IBS epidemic. As I’ve often said, IBS, or Irritable Bowel Syndrome, is a diagnosis given to you by doctors, who in fact, have no idea what’s causing your symptoms. You see, SIBO is what’s called a diagnosis of exclusion. Once your doctor has ruled out ulcers, Celiac Disease, autoimmune diseases such as Crohn's, or even cancer, they are left with no answers and apply a diagnosis of IBS. Little do they know that the constellation of symptoms that they label as IBS are almost always caused by Small Intestinal Bacterial Overgrowth. In fact, recent research has found that up to 50% of people diagnosed with IBS are actually suffering from SIBO! The overgrown bacteria disturbs your gut's normal activity, impacts brain function, and can allow your gut to become leaky, leading to chronic inflammation and perhaps even an autoimmune disease. Fortunately, using simple and effective dietary changes and targeted supplements, you can restore your gut's healthy microbiome balance starting today! "I have seen the frustrating and crippling effects of SIBO first-hand in my clinic, and I have seen the incredible transformation that patients experience by finally getting the help and guidance they need. When the gut microflora return to a healthy state of equilibrium, and balance is restored, I've witnessed energy and vitality return, mental clarity restored, and chronic symptoms fade away. You’ll get the same powerful supplements, easy-to-make meal plans, and thorough support that I use in my clinic to help my patients rebalance their gut microflora, and overcome their chronic symptoms." The SIBO Breakthrough Wellness Kit includes both of the powerful, pharmaceutical-grade supplements you’ll need for the program. Of course they’re completely free of gluten, dairy, corn, and soy. Consider the Optional Gut-Repairing Upgrade to accelerate your gut repairing process and empower your body to remain free of SIBO. Leaky Gut Revive® - Helps repair your leaky gut so you can banish the skin issues and food sensitivities. Collagen Protein - Helps fight sugar and carb cravings that fuel SIBO bacteria and seal a leaky gut so you can kick gas and bowel trouble goodbye. PUT ME ON THE FAST TRACK! Complete The Protocol. Clear SIBO For Good. One of my Program participants, Geneveve L., told me that even after less than a week she can already tell that this is working. She feels SO much better already. This program truly is amazing her. She had spent at least $1,000 in the last 18 months on supplements to try and fix her issues and none of them worked. She almost had to quit her job because she was having to scurry to the bathroom multiple times a day in the middle of calls! She literally can’t wait to see the difference once she’s finished. Raul V. let us know that his wife convinced him to try the program to finally clear up his skin and he admitted that he was afraid because of the diet changes. Several weeks in, he says that, so far it has been really easy because the food tastes great and is easy for him and his wife to fix together! It seems like a miracle to be able to eat dinner without the immediate gas that he was so used to trying to hide from his wife. Even though she had been terribly underweight since graduating college, Meredith P. told us her stomach would look like she was carrying a 10lb baby as soon as she ate something, even water would make her bloat terribly. Her doctor ordered a SIBO breath test, which came back positive, yet nothing her doctor tried made any improvement in her symptoms. She says that she didn't realize how much of an issue her SIBO was until she started the SIBO Breakthrough™ Program. In just a few days, she reported that her “food baby” was gone. She FINALLY has a flat tummy (for the first time in years) and she’s actually digesting her food normally now without gas and and having to run to find a bathroom when she’s out with her daughters, her dogs, or her husband. Finally, a flat tummy after frustration with my doctor! Kelly Anne W. let us know that her skin is the clearest it’s been in years. She was diagnosed with IBS and Rosacea when all of her digestive troubles started, and her troubles had only gotten progressively worse since then. Nothing she took helped, other than powerful steroids which made her angry and anxious (not to mention the concerning long term side effects!). Finally she says she can look in the mirror and not see raised red bumps on her cheeks and chin, and there we absolutely no drugs required to get there! IBS and Rosacea gone, WITHOUT harsh medications! CHOOSE YOUR PROGRAM AND START TODAY! While your supplements are on the way, you’ll have time to print your shopping list, prep your kitchen, and dive into the resources that will help you restore your gut’s balance. Get started today! Your life is waiting. The Myers Way® SIBO Breakthrough™ Program gives you the tools you need to directly impact your health. To do this, you must invest not only in this program, but also in yourself. That means fully committing to reading the materials, sticking with the diet, and taking the supplements. We also strongly recommend joining The Myers Way® Facebook group! You will have our support all the way through, and the tools you need to sustain a lifetime of health. Is there a limit to how many people can participate? Yes, in order to give as much attention as possible to each individual in the program, we have limited the number of participants in order to ensure an intimate experience. If you are traveling during the program you will still be able to participate. You can download and/or print the materials ahead of time, and be sure to pack the supplements you will need during your trip. You may need to do a bit of extra planning and research to ensure to plan your meals in advance, and we have included helpful checklists of which foods to enjoy and which foods to avoid to help you do that if you need to deviate from the set meal plan. When you’re living with illness, it can be daunting to feel like you have to put one more thing on your plate. Almost everyone we’ve ever worked with has had to overcome some version of this fear. And, the bottom line is - we all have the same number of hours each day. Countless others have made the time to follow this program and their success is proof that it is possible for you to succeed as well. That’s why we’ve created a simple meal plan complete with shopping list and preparation guide to help ensure your success. You can download all of the program materials, including eBooks, meal plans, recipes, and shopping lists to your computer, and you may also print them if you choose. We will be sending you emails throughout the program, so you’ll want to keep an eye on your inbox! The program materials will download directly to your computer, where you can save, access, and print them as long as you like. Can I do this program if I’m pregnant, or nursing? Yes, you can participate in the program, the diet and probiotics are perfectly safe for pregnant or nursing women. However, it is not recommended to take the Microb Clear™ while pregnant or nursing. Please note that this process may take a bit longer than the guaranteed 30 days so you are encouraged to maintain the diet until your symptoms subside and can add in the other two supplements after you finish nursing. Dr. Myers has directly impacted the lives of tens of thousands of people dealing with SIBO and related health issues. If you follow the protocol, we are certain you will get results. In the unlikely scenario you see no improvement, we do have a guarantee policy in place which you can read more about by clicking here. 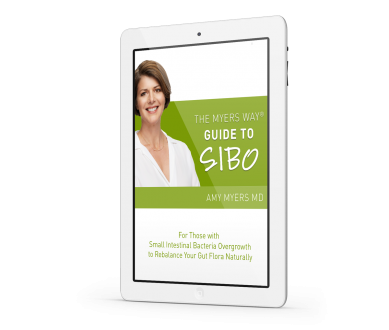 The Myers Way® is an approach to empower you on your own self-led journey with SIBO. Because everyone is different, I cannot guarantee specific results. I am confident that if you follow the protocol, and take action accordingly towards your goals you will see an improvement. If the information wasn't what you needed then we will happily give you a refund. Digestive balance is possible! There is no need to continue struggling with discomfort when dietary changes and supplements can effectively support your digestive health and a balanced and healthy gut microbiome. 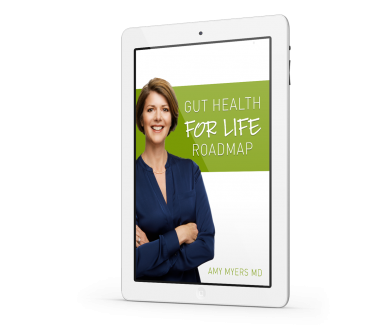 On the other hand, if digestive imbalance and dysbiosis persists, it can lead to leaky gut, which has been linked to numerous chronic illnesses. Getting your gut microbiome back under control will help to support a healthy and balanced immune system, good digestion, and proper nutrient absorption. This phenomenal program is based on science, research, and Dr. Myers’ own clinical experience. 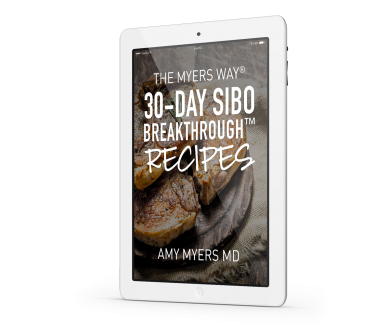 Dr. Amy Myers has had hundreds of patients and thousands of community members complete the SIBO Breakthrough™ Program in her clinic, and at home, with tremendous success and consistent results. 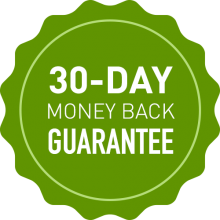 It's easy to follow with clear explanations, simple instructions, and everything you need for the full 30 days included in the program. We understand that SIBO can often cause brain fog, and that programs like these can be expensive, so we made The Myers Way® SIBO Breakthrough™ Program both straight-forward and affordable. You deserve to start feeling better TODAY! Every day that you wait is another day of exhaustion, frustration, and discomfort. Your health is too important to put off until later, so start now! Are you tired of experiencing fatigue, brain fog, digestive issues, sugar cravings, and wanting healthier skin and nails, a happier outlook and a more balanced mood?? Are you sick of wasting money on conflicting opinions, countless supplements, and discouraging diets that don’t seem to help much? Are you ready to follow a proven, yet simple 30-day program that includes all of the tools and resources you need to complete the program successfully? Are you willing to invest in yourself to reap the rewards of optimal health and renewed vitality? If you answered yes, then this program is perfect for YOU! I'M READY TO BEAT SIBO!